We’re having so much fun handing out free trips, we’ve decided to keep it going in March. 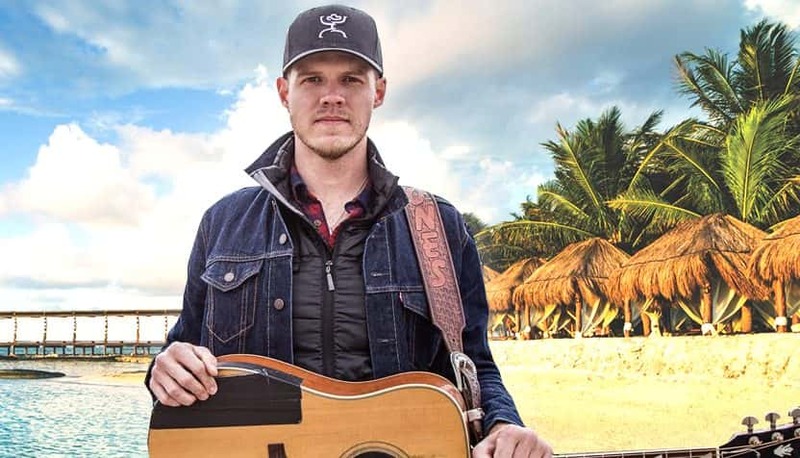 Tune in at 7, noon, 5 and 7 weekdays to get qualified for your chance to hang out with Justin Frazell and Randy Brown at the Rednecks with Paychecks Shore Thang Getaway June 23rd through the 27th in the Riviera Maya. 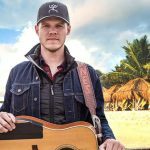 Featuring Sam Riggs, Austin Allsup, Tanner Fenoglio, Sonny Burgess and Jolie Holliday. Trip includes round-trip airfaire, accommodations at the El Dorado Seaside Suites Beach Resort & Spa, round-trip transfers to the destination, and all music events. The taxes are the responsibility of the winner. 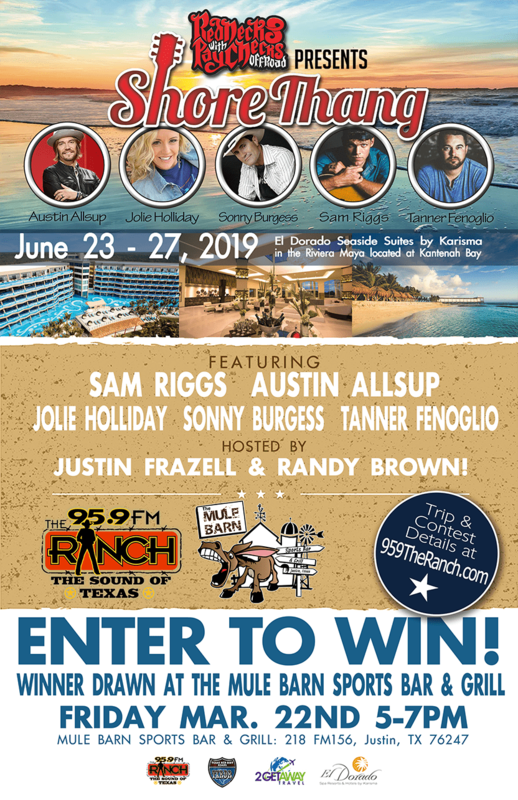 To get qualified for your chance to win listen to 95.9 The Ranch right at 7am, noon, 5pm and 7pm Monday through Friday, March 4th – March 22nd. 1. Void where prohibited or restricted by law. 2. Must be 21 years of age or older to enter, qualify, and/or win. 3. All prizes are non-transferable, non-assignable, and cannot be redeemed for cash or other consideration. 4. No substitute prizes will be allowed except by the individual Sponsor(s), who reserve the right, in connection only with the specific prize each is providing, to substitute prizes of equal value or nature. 5. The prize winner and/or his/her guest on the trip is responsible for compliance with all federal, state and/or local laws and regulations that apply, including, without limitation, payment of applicable taxes. 6. All expenses not specifically provided for in the “Prize” section below are the responsibility of the prize winner and/or guest. 7. Taxes are the responsibility of the winner. 9. Employees, agents and/or affiliates of the Ranch, LKCM Radio Group LP, and/or Sponsors, along with their immediate families and/or household members, are not eligible to enter the contest. Immediate family includes, but is not necessarily limited to, spouses, parents, children, siblings, grandchildren, and grandparents. 10. The Ranch has sole discretion to render ineligible or disqualify any entrant or qualifier and to proceed with the contest as it determines appropriate. 11. In the event that no person, entrant, or qualifier meets the contest criteria, the prize will go unawarded. 12. This prize is date specific, and the winner must be available on the specified dates of June 23-27, 2019. If the winner is not available on these dates, the Ranch reserves the right to select another winner. The Ranch is not responsible for losses, injuries, death or any other liability resulting from trip rescheduling or cancellation. No substitute prize will be provided. 13. The Ranch is not responsible for entries not received due to technical issues in the entry or selection process, including, but not limited to, phone or internet service outages, computer or phone difficulties, and delays. Proof of submission is not proof of receipt by the website administrator for online entries. Qualifiers must provide all requested information when requested. 14. No Sponsor and/or affiliate of a Sponsor or individual representing or associated with a Sponsor or affiliate has any liability for any injury, death, or damage to either persons or property by reason of entering, qualifying, winning, and/or participating in the contest and/or the use of any prize in the contest. Individual privacy settings must be set that The Ranch can see the sharing of the post. 15. The Ranch reserves the right to change, update, or amend any rules without prior written notice. 17. If someone has booked and paid for the Shore Thang trip and subsequently wins the contest, that person will have their money refunded to them. 18. By participating in the contest and/or accepting any prize, all entrants, qualifiers, winners, and winners’ guests are agreeing to these Official Prize/Contest Rules and agree to, as allowed by law, release the Ranch, the Sponsors, and all of their affiliates and/or representatives and/or agents from all liability in connection with the contest. Five  qualification will be given away at the Winner Party at the Mule Barn Sports Bar & Grill (218 FM156, Justin, TX 76247) Friday, March 22, 2019 between 5pm – 7pm. All in attendance can register to become 1 of 5 last chance qualifiers. at approximately 7:30pm, 5 names will be pulled at random and added to the qualifier drawing to win the trip. On Friday, March 25, 2019, from 6pm-8pm, the Ranch will host an event and remote broadcast at the Mule Barn Sports Bar & Grill (218 FM156, Justin, TX 76247). At that event one winner will be selected from all who qualified for the trip. Qualifiers will need to check in with the Ranch promotional team, must be present to win. If the qualifier meets all criteria as described above and either has a valid passport or is willing to obtain a valid passport prior to the trip, that qualifier wins the trip prize package.